Although asthma is a common disorder affecting approximately 7.8% of the United States population (Schiller et al. 2006) or 23 million Americans, the pathogenesis of this disease remains to be fully elucidated. Extensive research over the last few decades has yielded a better understanding of asthma. We know that the basic features of asthma include episodic airways inflammation, airways hyperresponsiveness, and mucous hypersecretion. Although we understand the basic clinical features of asthma, the links between symptoms, physical signs, and underlying pathophysiological mechanisms are still being delineated. 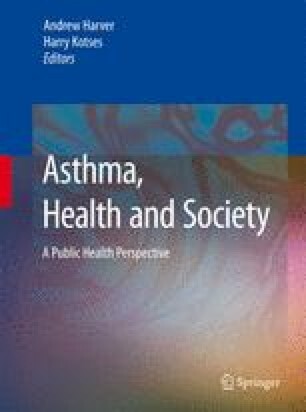 Asthma is a heterogeneous disease process with varying phenotypes and presentations. In this chapter, we will briefly explore some major theories of asthma pathogenesis, both new and old. We will also explore how understanding the pathophysiology of asthma can help us to understand the symptoms and presentation of asthma, as well as the best strategies for diagnosing this disease.